Did you know that the Canadian Center for Occupational Health and Safety encourages work-time physical activities to help employees significantly reduce stress, increase productivity, lower health care costs and decrease absenteeism, which can save businesses money? SO WHY NOT OFFER YOGA AT YOUR COMPANY? MIND TO BODY OFFERS CORPORATE MEMBERSHIPS AS WELL AS ON-SITE YOGA CLASSES THROUGHOUT THE GTA AREA. Mind to Body provides on-site classes to corporations, universities and other institutions throughout the GTA area. Our team of certified and experienced yoga instructors will work with you to create a program that makes sense for your business. We are able to offer classes before, during or after your workday. Mind to Body offers a variety of classes, and can tailor any class to meet your employees/businesses specific needs. Our classes are carefully designed to be accessible to everyone regardless of fitness level and skill. A corporate session with Mind to Body includes everything necessary to create a studio experience in your workplace – we bring the yoga mats, props and more! We also offer chair yoga classes right in your boardroom, meeting and conference rooms. Chair Yoga is for everybody! This can be performed at your workplace in a space of choice such as a board room, office or main entrance way. Chair Yoga is also great to do at your next business conference. This type of Yoga helps to relieve neck and shoulder tension, back pain, tension headaches, etc., and is a great pick-me-up to help rejuvenate your mind and body. Executives need to take loads of initiatives and risk in their work. One needs lots of focus and concentration, stress free mind, and the physical stamina to plan, execute, monitor and evaluate projects in a competitive business environment. These one-on-one yoga practices include postures for physical rejuvenation and mental relaxation, meditations to rewire the brain for creative work, breath work to achieve mind-body balance, and strategies to get control of mind to accomplish more in less hours. The practice of yoga will help executives drive towards success, with a creative brain, mindfulness, strong body and serene mind. 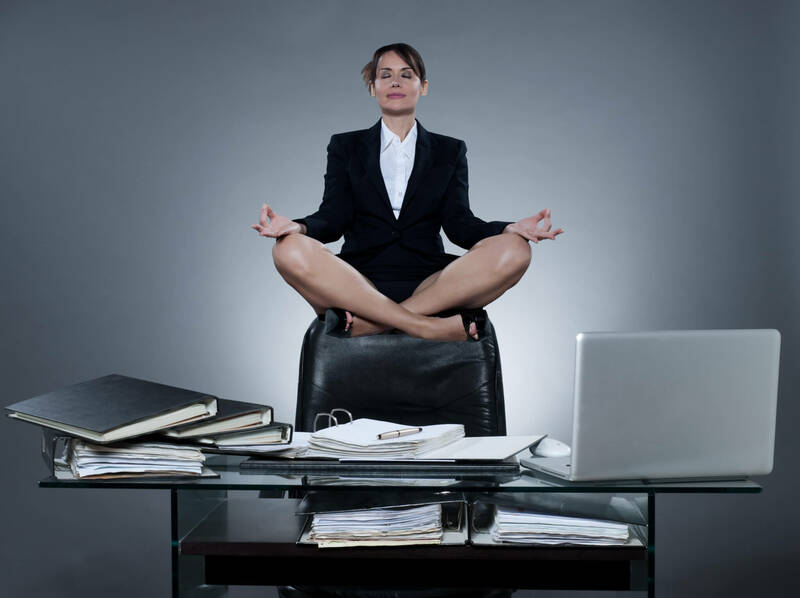 Learn how to use yoga practices to enhance your productivity at work and in life. Learn the difference between brain and mind. Includes strategies to use your mind vs. your mind using you, physical postures to remove accumulated stress in your body, breath work to improve focus and concentration.